On September 17, Nickelodeon will debut Rise Of The Teenage Mutant Ninja Turtles, the latest reimagining of Kevin Eastman and Peter Laird’s heroes in a half shell. Showrunners Andy Suriano and Ant Ward are blending the new and the familiar, giving the property a revamped look courtesy of 2D animation, while also hearkening back to the comics to shape the first season’s storylines. Suriano and Ward may have shaken up the order of the team—and given us a new villain voiced by John Cena—but they’ve left the turtles’ tight-knit dynamic intact. This family slices and dices together, and the show has put together a complementary voice cast, including Ben Schwartz as Leonardo, Josh Brener as Donatello, Omar Benson Miller as Raphael, and Brandon Mychal Smith as Michelangelo. Kat Graham rounds out the team as April O’Neil, who’s now roughly the same age as the turtles. The A.V. Club spoke with Schwartz and Graham at the 2018 Television Critics Association summer press tour last month to get their thoughts on the latest trends in programming and pizza, as well as just what the hell the secret of the ooze is. The A.V. Club: There was a rather bold decision made early on to break with lyrical tradition and make Raphael the leader. Where does that leave your character, Leonardo, who we’re so used to seeing lead the team? Ben Schwartz: Yeah, at the beginning, Raphael is the leader. Because it’s the rise of the group, the whole idea of them learning and failing. You watch the first couple episodes, and the turtles, it’s like we can’t even land correctly, and we have no idea how to use our weapons. So it’s like the first act of those superhero movies, like the latest Spider-Man, where they’re learning how to use their powers. AVC: Has it freed you up in creating a new version of this character? Because we’re used to seeing this very serious, focused version of Leonardo, but here, he’s almost the droll action hero—always ready with the one-liners. BS: I’ve had a blast working with Ant and Andy in creating this character. I’m basically playing him like Bill Murray in Stripes. When we were doing auditions, I was like, “You know what, I kinda like the idea of him being Bill Murray-ish and being ready to joke about stuff.” Ant and Andy really wanna push the comedy in this one and they let us play, and when we found a nice little level, they’re like, “This is perfect, go with this,” and then they write to those attributes. It’s been really fun, and seems to fit really well. AVC: Kat, you’ve helped create an all-new April. In the past, she was this grown-up journalist, but she’s a lot younger now, which makes sense because these are “teenage” mutant ninja turtles after all. So is this kind of an origin story for April, too? 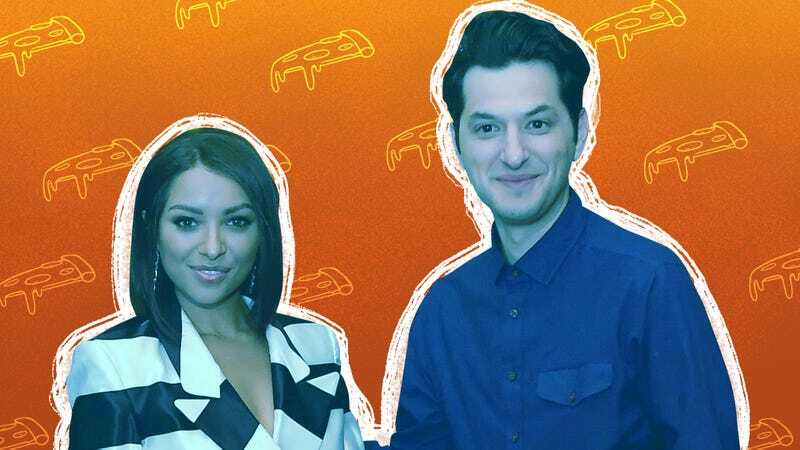 Kat Graham: They’re all figuring out who they are—very clumsily—but still trying to save the world. I’m really happy that they made her younger; it means we can do more. We can have more fun that way. And there’s something very important about not just the fact because they made her African-American, but someone that sometimes fights alongside the turtles. I think making her roughly the same age helps tell the story and creates a really cool dynamic with all of them. AVC: Did you have any input on the character design at all? KG: I would never dare. [Laughs.] I can draw a stick figure, and, I mean, Ant and Andy are just—they’re overqualified to create these. It’s really art, this animation. They knew exactly what they were doing, and they had a vision for this character, and I felt super trusting to lend my voice to whatever they decided to create around it. AVC: Were you big fans of the movies or comics before signing on? BS: Yup, at my first sleepover we watched the first movie [the Steve Barron-directed Teenage Mutant Ninja Turtles]. I remember I wasn’t able to go to sleep, and I wanted to call my mom and dad. AVC: That first movie did have a very different aesthetic. Were you scared? BS: I was never scared by them. I just thought they were awesome. I think I was just so excited I couldn’t go to sleep. I loved it. That first one to me was—I used to quote it as a kid all the time, with my friends. And of course, there was the Vanilla Ice rap, the Ninja Ninja rap, in the second one. I mean, what a gift that was. I loved that. They randomly go to a stage and everybody’s dancing and singing. It’s a beautiful little thing. AVC: What are your thoughts on the ninja rap from the recent movie reboot? BS: Wait, which one is that one? AVC: “Shell Shocked” [by Juicy J., Wiz Khalifa, and Ty Dolla $ign]. How do you think it compares to “Ninja Rap”? BS: Oh, man, I haven’t seen it. AVC: How about you, Kat? KG: [Laughs.] No, no, sorry. BS: But I will say, Kat can sing so beautifully, so you know, if there’s ever a chance on our show for Kat to create music as April or me as Leo, I’ll happily pretend to move my mouth and she’ll do everything. I mean there’s an opening for that, don’t you think? KG: Well, I’m so happy with this version of April—that hair and those glasses!—that I will just say my little lines. But I mean, listen, if anyone ever needed that I would do it in a heartbeat. The Turtle-verse is so big that if [the producers] wanna do [that] and if they need me, I’m here. AVC: It was brought up at the panel how voice acting is a real solo effort. It’s just you and the booth. But when you’re playing a famous ensemble, cohesion among the cast is really important. How were you able to establish that? KG: It was a little hard, because I don’t live in Los Angeles, so I unfortunately haven’t been able to record that much with the boys. I recorded a bit with Josh [Brener] while he was shooting in New York. He has a very specific voice, so when I do my lines, I’m thinking of how to respond to those specific tones. I was familiar with everyone’s work before this show, so I just try and think of their temperament when I’m recording my lines. I try and think how Ben would do that line or how Omar [Benson Miller] would do it, and I try and not do anything that’s so left field from their performances. BS: We learn their cadences. You know that Josh is gonna deliver like this, and Omar’s gonna come with a lot of energy and stuff like that. One of the cool things in the beginning was we got to all record together a couple times. It gets harder because we’re all moving around, but you have Rob Paulsen, who’s a genius. He’s the voice director and he’s been two different turtles in two different iterations. He’s also Pinky from Pinky And The Brain! He’s been everything ever, including Yakko [on Animaniacs], and so he helps by doing their voices. You kind of get into a rhythm and you learn exactly what to do. But also, in doing press together, we’ve really become a little family. AVC: Now for the important stuff: How prominently is pizza featured in the reboot? BS: Prominently. It’s like the secret sixth turtle. KG: Yeah, it’s like its own character. For sure. AVC: When they first announced the reboot, PETA issued a press release asking for vegan pizza on the show, which would be one way to update it. BS: [To Graham] You’re a vegan, right? KG: Yeah, and I work with PETA, so I appreciate them saying that. I did an exposé on a chicken farm with them, like, a week before this one came up. I would love it if they did a vegan pizza on this. But even if they don’t, everyone knows that I’m vegan, so I promote it enough on my own. AVC: Splinter is back to mentor the turtles, but Shredder is out as the big bad. Is there any character from one of the previous iterations you’d like to see on the show? KG: Well, Splinter was my favorite, so that’s a huge box that got checked for me. But, otherwise, I don’t know. BS: Oh man, I would say it should be Bebop and Rocksteady. I would also say Baxter Stockman, especially that story where he turns into a fly! That was one of my favorites. I’m just impressed that I remembered the full name. But he’s one of my favorites, and I love that origin story, so that would be super-fun to see come play. But also, Bebop and Rocksteady for me were the best—they were like Tweedle Dee and Tweedle Dum, just two dummies trying to smash their way through things. I don’t know if they’re gonna appear, but those were the guys that I loved when I was watching as a kid. AVC: The producers have said that this show will tap into the original source material. Did that appeal to you when you first signed on? Because there’s the potential for a really interesting crossover—the turtles became mutants in the same incident or accident that injured Daredevil. KG: Oh wow, I’d never heard of that. AVC: Maybe that’s one of the secrets of the ooze. BS: In the comics? Were they owned by Marvel? AVC: No, it was Mirage. BS: Oh, yeah, I’ve heard of Mirage. AVC: Apparently, when Kevin Eastman and Peter Laird first dreamed up a Ninja Turtle, they thought about that accident and the stuff that blinds Daredevil and that’s what makes Ninja Turtles. BS: That’s amazing. I’ve never of heard that before. AVC: Does a Ninja Turtles/Daredevil crossover sound cool, or is there another comics character you’d like to see on your show? KG: Oh my gosh, there’s so many crossovers that could be fun, too. BS: Oh my goodness, yes. KG: Daredevil is a good one. And I don’t know why, but Inspector Gadget. BS: Oh my goodness, please. Please make Inspector Gadget appear in our TV show. What a beautiful joy. I loved Inspector Gadget. KG: If they ever do live-action mixed with cartoons, like Who Framed Roger Rabbit, you should play Inspector Gadget on the cartoon. AVC: You could even do that as a separate reboot. BS: Seriously. Oh, this is a huge moment for me, thank you. But you mean on the cartoon, or the live-action part? KG: No, you do the live action but you’re in the cartoon—like Roger in Who Framed Roger Rabbit. BS: Yesss. I’m very into this idea. KG: That’s all I want in life. Sorry, that was not your question at all. BS: No, but I will say this, this tangent has brought me to a very happy place.